New homes, including their garages, are designed to be energy efficient and thermally effective. They are relatively easy to keep warm in colder weather. In previous generations, people were often content to live with “a draft” in their old homes. There are, of course, many old homes in the Greater Victoria region and many of these have garages that are not up to today’s standards of insulation. Updating your garage to keep it warmer will have a positive impact on the warmth of the living space inside your home, as a cold garage has potential to transfer cold temperatures into neighbouring living spaces. Most homes will have a wall and a door connecting the house to the garage. In older homes, these areas may not be insulated to today’s higher standard. The wall may have no insulation and even no drywall, on the garage side. The door which leads into your home may also have poor or no insulation. Additionally, it was common to not insulate any of the walls, or the ceiling, in old garages. You will be using a considerable amount of natural gas, electricity or oil to heat your home in the winter season. To provide extra warmth and cut down on heating bills, having a properly insulated garage is important. You may want to insulate and drywall the old garage walls yourself. If you’re new to home renovations, you’ll soon find out that this is a messy and challenging job. Having an experienced handyman friend (or hiring someone) will go a long way towards getting it done faster and better. Swapping out an old entrance door may require adjusting the size of the entrance to fit new, insulated doors which are of standard size. If the garage door itself is not insulated, it may or may not be suitable for adding insulation, depending on the nature of its construction. Replacing the door with a new insulated garage door may be the best option and will also improve the look of the exterior of your home. Once the larger insulation updates are done, check around for small cracks or spaces which would let in the colder winter air. These are common around window openings and of course, your garage door itself. If you kept an insulated older garage door, check the weather stripping on the bottom of the door. This material gets brittle and cracked over time and may need to be replaced. 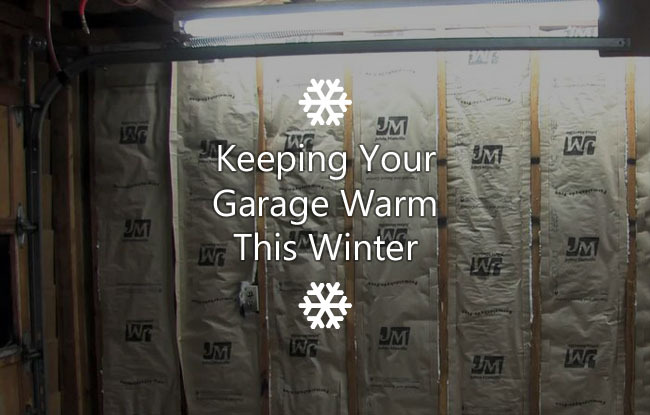 We want to help keep your garage safe and warm this winter. If you would like to discuss what kind of garage door would look great, while keeping your garage warm this winter, please contact us.